Hearing officer Bob McLean (at microphone) spells out rules of procedure for Water Quality Control Board members. It was a long day at the County Code Enforcement building at the Shelby Farms governmental complex, where TVA’s plans to drill into the Memphis sand aquifier were at stake, but the result — a 7-0 vote by the County’s Walter Quality Control Board against a Sierra Club effort to halt those plans — made unexpectedly short work of an issue that was expected to fester for a while. Testimony at a Board hearing of an appeal that would have spelled quietus on the final two of five wells envisioned by the Authority began at roughly 9:30 and ended at 5 with a motion from Board member Tim Overley, utilities director for Collierville, to reject the appeal. The vote was by a show of hands at the direction of hearing officer Bob McLean. 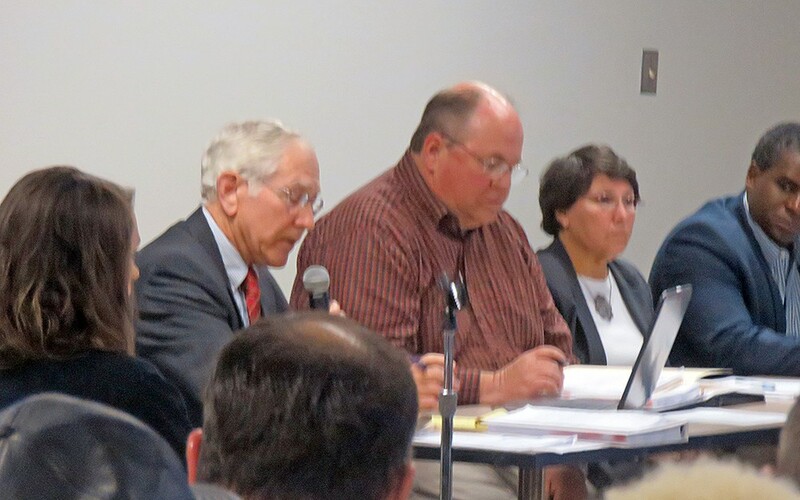 There were three recusals for various reasons on the 11-member board and one absentee. The outcome apparently leaves TVA free to continue with its preparations to draw some 3.5 million gallons a day from the aquifier to use as coolant for its forthcoming natural-gas power plant, scheduled to open in 2018 as a replacement for the coal-powered plant it currently operates. 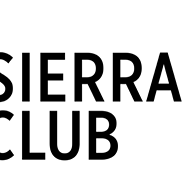 The Sierra Club’s Scott Banbury, backed by a coalition of environmentally minded citizens and organizations, had filed an appeal in September to reject permits issued by the county’s Health Department for the two wells. Three wells had already been drilled — before public notice had been given, said Banbury — but have not yet been outfitted with pumps. 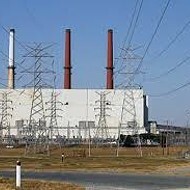 TVA maintained that it needed the five wells to provide the plant’s core function of serving 1.5 million customers in the Greater Memphis area, that alternatives of using water from the area’s Maxson wastewater plant or the Mississippi River alluvial aquifier or even of purchasing water from the sand aquifier from MLGW were all considered but finally deemed insufficient for the purpose. The environmentalists supporting the appeal via an organized “Protect the Aquifier” movement spearheaded by advertising executive Ward Archer have argued that the all of the discarded alternatives were feasible and that the Authority’s plan to drill into the sand aquifier was both unnecessary and endangered the famously pure drinking water with the prospect of pollution through rifts in the aquifier’s surrounding clay walls. That case was made on Wednesday by Banbury, supplemented by supportive scientific documents placed on the record and by the videotaped testimony of Brian Waldron of the University of Memphis, but a rejection of the appellants’ motion for a continuance resulted in the exclusion of direct testimony from Waldron and other experts, all of whom were attending a professional conference in Ecuador. 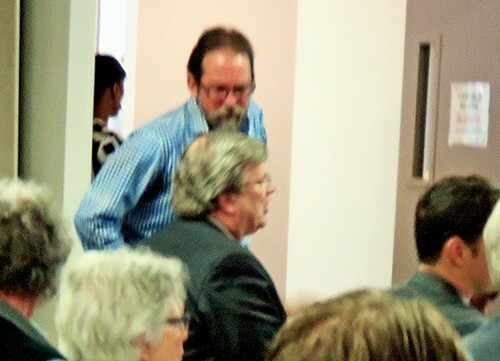 Appellant Scott Banbury talks with Memphis Mayor Jim Strickland before hearing. Meanwhile, both the Health Department and TVA were able to boast a full array of witnesses supporting the Authority’s contention that the aquifier wells were necessary, were harmless to the environment, and had been properly vetted through accepted county-government procedures. 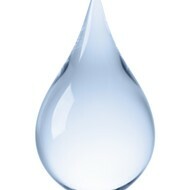 Ironically, the Shelby County Commission is due shortly to consider changes in those procedures (a course called for as well on Wednesday by a member of the Water Quality Control Board), and the Memphis City Council has passed a resolution calling for TVA to employ a different method to acquire its source of coolant water. 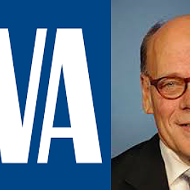 Memphis Congressman Steve Cohen had also weighed in for a change in course. The appellants had discussed in advance the possibility of appealing a negative finding by the Board through Chancery Court but have not yet decided whether to pursue that avenue. The hearing on Wednesday was conducted to make it as close to a pure legal process as special hearing officer McLean could make it — complete with formal objections that could be sustained or overruled — and as far as possible from anything resembling a pure policy discussion. The audience — which included numerous members of the “Protect the Aquifier” movement, some wearing identifying T-shirts — was expressly warned against any form of demonstrations. 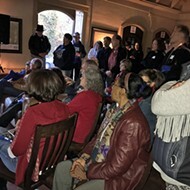 A participant on the Health Department/TVA side characterized the process as being one of “rules versus emotions,” and the result of that emphasis was that discussion was steered away, over and over again, from ecological matters per se to the more limited question of whether the Health Department had followed checklist guidelines in making its preliminary decision to grant permits for the proposed TVA wells. McLean’s conduct of the hearing seemed generally even-handed, particularly in his predisposition toward overruling objections, most of them from TVA lawyers attempting to disqualify testimony or exhibits from the Sierra Club side. But there were anomalies. Early in the proceedings, Banbury attempted to make a point about the nearness to the Presidents Island TVA plant site of an area pinpointed in a U.S. geologic survey as a weak point in the clay layer surrounding the Memphis sand aquifier. Asked by attorney Webb Brewer to specify exactly how close, Banbury began to answer, stating as his educated “guess,” based on familiarity with the area, that the exact distance was something like a mile, but was sharply interrupted by McLean, who said, “No guessing, Mr. Banbury!” and discounted the answer. Somewhat later, Ron Tibbs, general manager of major projects for TVA, was at the witness table, and more than once phrased an answer to a technical question as a “guess” without being similarly cut short. Many of the issues discussed in Wednesday's hearing engendered Rashomon-like differences in perspective by the contending parties. The unusually large energy-producing capacity of the forthcoming new TVA plant — planned to be considerably more than sufficient for the needs of the target population — was explained away by Authority witnesses as being based on redundancy safeguards, while Sierra Club spokespersons have seen it as obvious evidence of TVA's desire to expand its potential energy market beyond the current confines. And there were intriguing questions left short of full exploration — such as why it was that "gray water" (i.e., treated waste water) was sufficient to cool the Authority's Caledonia power plant near Columbus, Mississippi, but was regarded as out of the question for the forthcoming new plant here. 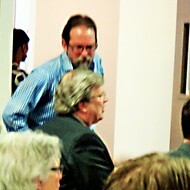 By and large, members of the Water Quality Board, many of whom held positions of engineering or environmental authority within Shelby County were respectful of the contending points of view at the hearing but, as their occasional questions to witnesses indicated, seemed inclined to give the benefit of the doubt to the testimony put forth by experts from the Health Department and TVA. In any case, their verdict was, as indicated, more a statement of approval that established procedures were followed in the Health Department’s granting of permits for the proposed TVA wells than it was an evaluation of the Authority’s contention that no other alternative existed than the one of drilling into the Memphis sand aquifier.